What years was Oakville served by the COALHAVEN? 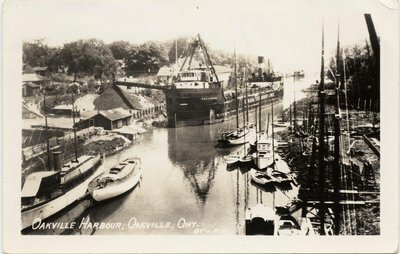 A real photo postcard of the harbour in Oakville, Ontario. The Canada Steamship Lines steamship COALHAVEN can be seen unloading coal on the east bank of Sixteen Mile Creek. A large steam yacht can be seen in the left foreground. Two masts of a larger sailing vessel can be seen in the right foreground. A variety of smaller sailboats can be seen along the right side of the harbour. Postally unused. COALHAVEN operated for CSL between 1928 and 1962. "Oakville Harbour Oakville, Ont by J.R.P."